I stepped up big time when I upsized the X member hole the last time. If i recall, the pipe was a heavy wall pipe (3/16" wall I believe) which gave me an ID of roughly 3.75". I'll be honest, I was concerned about the structural integrity of the whole X member having removed so much of the vertical component form it when you look at the cross section of, but there have been no issues after 10 years of use. This being said, I still have not altered my original stainless exhaust system I made of the car, and it still rattles! But whenever I do decide to get around to it, I'll have plenty of room to make it work right. Just some thoughts for you, the photos are of the stock exhaust hole and the last one I did for the car when I installed a set of my own camber/toe brackets. Not enlarging the exhaust through-hole in the rear crossmember was one thing I regretted in my last build. I had the crossmember off during slotting and didn't think about the exhaust hole at the time. I'm definitely going to have to open mine up more. If it's just me driving in the car, it's perfectly fine(unless I want to really accelerate, then my back end just slams down and sparks for days), but if I'm driving with my girlfriend and dog, any little bump and I'm scraping. My main concern though is that my emergency brake cable goes right in front of the hole pretty much as well. Any quick remedy for that or just try and pull it out of the way? Took it out for a drive last night to keep trying to break everything in, and more small gremlins are popping up. Mostly from it just warming up though, as I developed an exhaust leak(probably just header), coolant leak at bottom rad hose, and an oil leak. My right side frame rail under the hood is what's covered in oil and it's got me thinking it's either my steering box is leaking, or it's pressurized and shooting from my sandwich plate/filter/stock oil press sensor. Chances are it's my steering box though(which'll be rough as I imagine it'll be hard to get a RHD rebuild kit haha). and yes, I know this is greasy, but it was a temporary fix so I can start driving it. Steering box lube is generally either 90wt or grease, so it should be easy to distinguish between either of those and engine oil. My bet's engine oil. Parking brake cable is not sheathed at that point, so it shouldn't really be impacted by the exhaust heat. Given your current exhaust routing around the rear crossmember, it's no wonder you're having clearance issues. If you're getting that much squatting on accel, you may also think about bumping up the rear spring rate. Here is a link to a steering box oil drain, it might help. Turns out it was motor oil, and was a simple fix. Even got the exhaust temporarily fixed even more until I feel so inclined to tear the rearend out and open the hole up more. Took it to work and put it on the hoist, cut it and tucked it all nice and neat half an inch from the swaybay and bent it in so it actually fit really nice. Now I can drive with at least two people and no scrapes! (until acceleration). and what I mean for the parking brake cable is it's literally 2 inches in front of the crossmember hole. I picked up some sleeves + springs so I have a small future project to do here soon. I seen the how-to on ratsun for the homemade rear coilovers and figured I'd give it a go. Just need to save up and buy some T3 fronts and I'll get to building the rear. The next big thing I'm looking to do to it however, is to fix the steering. I've emailed datsport and maddat hoping to find parts but haven't heard back from either. I'm looking to get the correct RHD center-link as I'm currently using the LHD one which is leading to a few problems. ...Then I'll be looking to add on some tie rod ends to the mix once I actually find a center-link. Hoping to finish up the interior and have everything back together soon though. Just wish I could find a good condition in tact left side door panel. I did two up really nice, but ended up both being for the right side. Also need to order a set of door, gas and trunk locks so the car stops looking so incomplete driving down the road. ...and window seals as I have to cut up rubber hose to stick between the door and glass to keep it from rattling. Anyways, here's a few more pictures. Also, Curse that manifold I bought from CXracing, No matter what I do, the bolts keep loosening up on me to the point where I'm surprised they don't just fall out. No matter what I do, they won't stop coming out. No wonder I had such a bad exhaust leak for a while haha. sycklash wrote: Just need to save up and buy some T3 fronts and I'll get to building the rear. Don't see the reason. Look up "DIY Coilovers" here - basically uses the stock lower perch, loose on the strut, and a tube clamp for adjustability. You're never going to adjust them on a daily basis - you're going to set them and forget them. No reason for the $200 set of GC/T3 coilovers and springs. sycklash wrote: Also, Curse that manifold I bought from CXracing, No matter what I do, the bolts keep loosening up on me to the point where I'm surprised they don't just fall out. No matter what I do, they won't stop coming out. No wonder I had such a bad exhaust leak for a while haha. Well, It's been a while since I updated this so I'm going to type up what I remember haha. and as for the turbo manifold, I got different bolts, kept tightening them and no problem anymore! 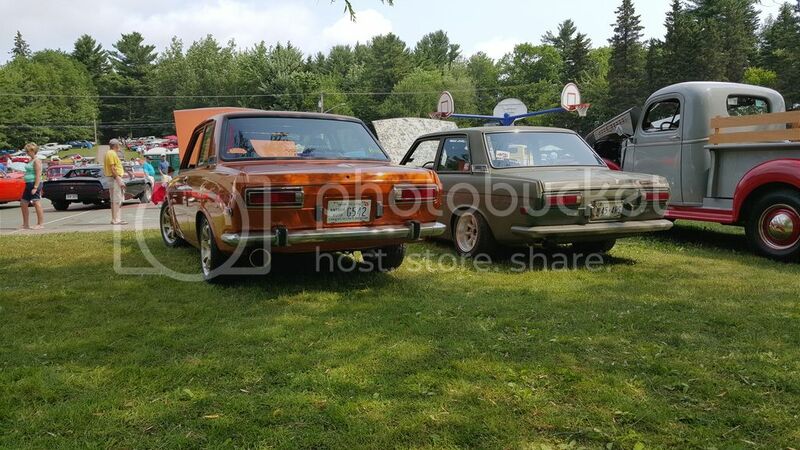 Me and my buddy, went on a cruise to the biggest annual car show around where we live (Atlantic Nationals - Only about two and a half hours from where I live). I ended up putting around 1000km on my car so that's pretty sweet. 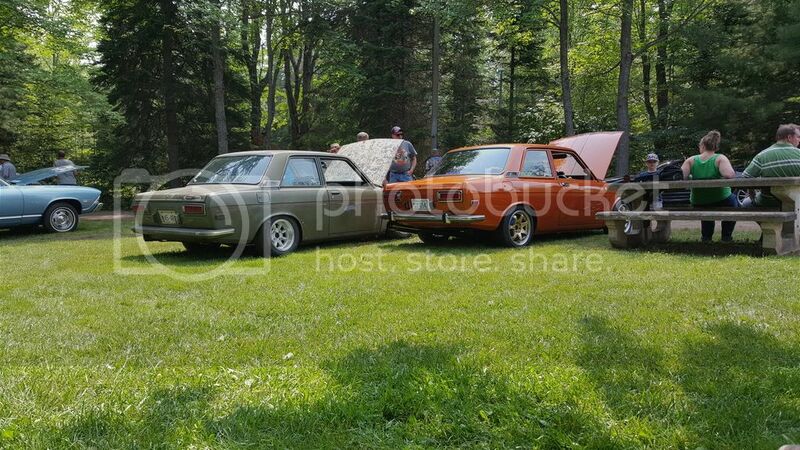 Me and him, along with one of our other friends we made there, were the only 510s out of 2000 cars. On the way, I realised that I'm having an oil cooling issue so I'm going to need to get an oil cooler for the car asap. It really doesn't like above 2500rpm on the highway as it stays around 205 F. If I cruise at like 2300ish rpm it stays cool down around 195-198 F.
another thing was that the day before the show, I finally got a new pinion assembly for my transmission so I could run my original speedometer in my dash, but the center for my speedo cable worked itself out while I was driving the vehicle so I'm still speedometerless haha. The other day, I received my new RHD center-link and tie rod end kit from maddat in Australia. I was so excited, so I drove it to work(in dartmouth, so an hour from where I live) so I could put it on the hoist in the afternoon on friday when it's slow and get my car a little safer. That plan went downhill fast as one of the center rods that connect the tierod ends decided to snap(thankfully while everything was off the car). The real dilemma here was that I had no other way home, and it's a 71 datsun so noone's going to have center rods for me(even though they were suposs to be supplied in the kit according to the photo). I ended up having to run to a machine shop and get them made For $130, and find out that one of the nuts were mangled and could not be used. I ended up buying a tierodend for a honda civic because the nut was a 14mm and fit the pieces that I had made .... or so I thought. It ended up fitting the opposite end of the one I needed but I was in such a hurry because everything closed at 5pm and it was 4:50 that I just went on my merry way. The reason it snapped originally was because I was using the LHD center link which made everything hit whenever I hit a badish bump which bent my tie rod ends and center rods, hence why I needed to change everything. Once I tried to take it all apart all the bent threads and everything just let loose. I wish I wasn't so hyper trying to fix everything so I could get home, that I took pictures though. I'll take pictures of my new custom tie rod center rods though as they're quite the sturdy unit now. but, on to pictures because words are boring. and a couple more off my instagram. aaaand I convinced my dad to take out his pride and joy for 33 years and take it to a car meet with me! What's wrong with your wheels? I think they look great. I'd love to make a drive out East next summer for an event like the Atlantic Nationals. Syracuse had a large one this past weekend as well. so I'm in a bit of a sour mood. The other night, I was preparing to go for a nice cruise with one of my good buds the next day so we could hit up a big car show, when suddenly I ran into the previous owner. We talked and talked, and said he wouldn't of built it this way, blah blah blah, and then we talked about the rearend and how I was hoping to find an R180 soon so I don't have to worry about babying the car anymore because it should be able to take the abuse, but he assured me that I'd NEVER blow up an R160. As soon as I left I gave it a shot, and ka-boom, the rearend miraculously did the impossible and got destroyed. I have a subaru R160 VLSD (thought was clutch, I'm so stupid), and ended up spending the weekend tearing it apart instead, along with the rearend out of the 510. The towing company wouldn't even let me bring my faithful lapdog pitbull in the truck so had to leave her in the car for the whole trip. really freaked her out. I swapped gears out of the subaru housing, put in the datsun housing, along with the pinion and set everything up, and put it back together correctly(hopefully), just to realize that the axles won't work. I get too hyper to do research when I'm working to get the car back together. I put everything back together, and started the car on jackstands, it worked, so started to go down the road, and made it about 50feet before the axle popped out on the left side. I since realized my mistakes as I'm just using the datsun axles (filled the centers with silicone lol), so I went out to my buddies and stole some subaru axles to machine. Now my question is, will any old subaru axles work? (they're equal length). or will I need to get the proper VLSD axles which has one longer than the other, to get them machined? Will the equal length ones work jsut to get me down the road and driveable again? I would buy an R180 but I just don't have the money right now as I still need to get better brakes and such for this before I spend $1000~ on a rearend set-up. 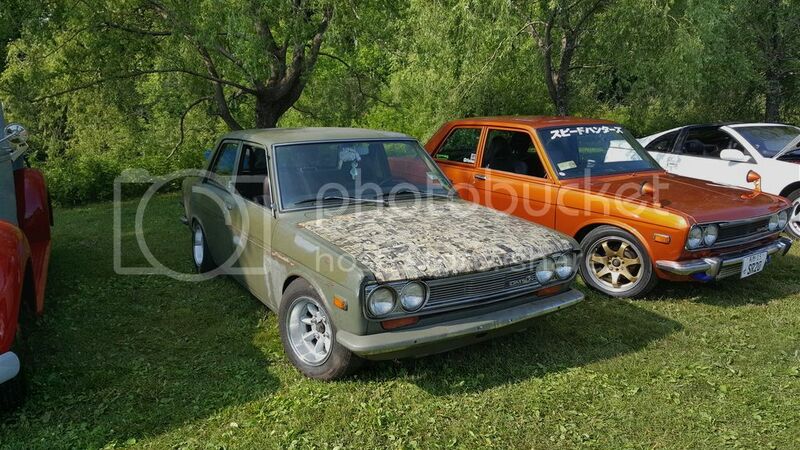 I may also be getting a stock R160 datsun open rearend from a fellow datsun enthusiast for the time being incase I can't manage to get the subaru one to work. so hopefully it'll be on the road here soon. Last edited by sycklash on 05 Aug 2015 12:28, edited 1 time in total. sycklash wrote: so I'm in a bit of a sour mood. Well...you drive an SR510 like granny and an R160 will last forever. You do clutch drops with that setup and it will die, as has been documented here more than a few times before. An R160LSD will take a fair amount of abuse, but even those have been killed behind SRDETs. As to the VSLD, there are apparently two gens of VSLD, one that comes with and requires the unequal axle stubs and one that does not. If you have the former, you'll need the unequal axle stubs to engage the LSD functionality. You can get down the road without it. Not to point fingers (but to put it down for future generations), this is why we suggest modifying the car to take the power before actually installing the power. But, of a variety of issues you could have given a stock 510 chassis and SRDET power, this is one of the least impactful, so you have that going for you. and as for modifying it before putting the motor in, I would have if the budget permitted. I haven't been beating it as I know I shouldn't (stock and terrible brakes, no front sway bar, stock rearend, not many chassis reinforcements, etc etc), so I've been babying it, just being happy to cruise around it with my pup to be honest. The PO just irked me a little bit so I decided to be a little risky to show that it's better than the old tired L20 that he had in it. as it was rolling it made it through first well, went into second and soon as I hit boost I heard a huge pop. I thought I blew the motor at first and was just cursing, then was afraid it could of been the transmission. I was happy to find out it was just the rear diff... One spider gear broke in half, where as the other one broke into three pieces haha. The DQ has at least three articles on adapting the Subaru VLSDs to our 510s. There's also one or two threads on here on the modifications necessary, though I don't have those references handy. So turns out I robbed the wrong axles from my buddys subaru. They ended up being 23 spline after the hassle of tearing that rusty thing apart haha. but thanks to my buddy, I was able to get a rearend from him and shove it in the 510 so I can continue babying it so I can enjoy driving it until the snow hits, or I get a subaru rearend underneath it again. Those R180's are so hard to find. Calling junkyards all over Canada without any luck haha. Anyway, I got the car together, but then rain hit so that was a bummer. It's been raining here in Nova Scotia a lot lately which is a pain because there's only a few nice days to drive (having no working wiper motor atm is a downfall too haha).